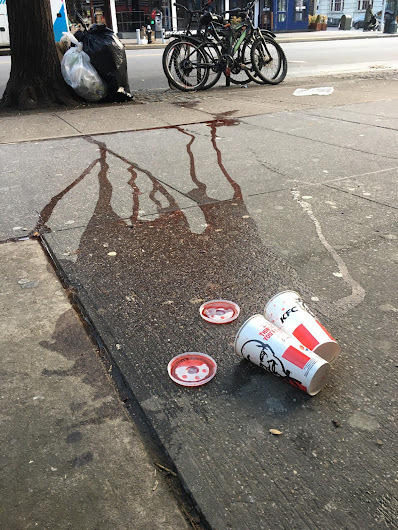 Actually this unfortunate double spill likely happened last night as the KFC on 14th Street and Second Avenue wasn't open yet today. Meanwhile, we will work to recreate how this occurred. It doesn't appear to be a drop, given the position of the cups and the integrity of the structure... the spill tracks also suggest a more gentle flow as opposed to a splat (scientifically speaking). 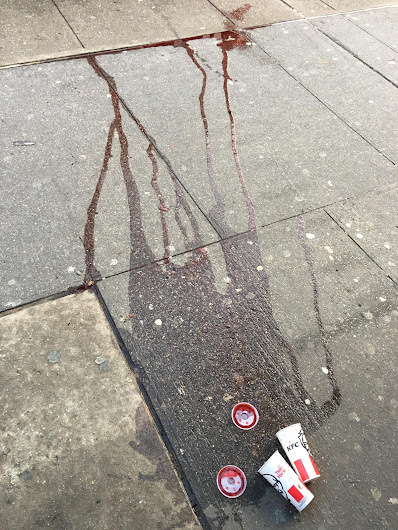 This incident needs the diligent expertise of people who have watched at least 5 seasons of CSI. The extended spill trails kinda resembles the Con Ed station. From the juice soaked streets of the city that never sleeps, but naps a lot, a dire tale of woe, of two Tropicana containers, kicked over by a wayward toe. "Splat" is definitely a scientific term.